On the radio and on television you are sharing the services of the First Baptist Church in Dallas. This is the pastor bringing the morning message entitled The Preservation of the Word of God. Some years ago, the pastor published a volume entitled These Issues We Must Face; and in that book there is a message printed, one delivered here in this pulpit, entitled The Preservation of the Word of God. I could wish that in the library, or buying it, or borrowing it, you would read that message. For the years since, I have wanted to deliver another message on the keeping and the preservation incorruptible, inviolable, inerrant of God’s holy revelation. I have been preaching for these last several Sundays on the Bible. This will be the last message delivered in that series, and it concerns the desire of my heart to speak once again on how God has preserved, kept inviolate, His inerrant and unchanging Book. Now, the message is built around three passages of Scripture and three words in those three passages. One is in the Psalms, a Hebrew word, a Hebrew verse; the second is in 1 Peter, first chapter, in a Greek verse; and the third is in the fortieth chapter of Isaiah, a Hebrew word in a Hebrew verse. We turn first to the Psalm; it is 119, and the verse is 89. The Greek word is nitzav, nitzav. The one hundred nineteenth Psalm is by far, by far, the longest chapter in the Bible; it has one hundred seventy-six verses, and every one of those verses mentions the Word of God, except verses 122 and 132. It is a paean of praise in thanksgiving and adoration to God for His immutable, unchanging Word. Now our verse, Psalm 119, verse 89: “Forever, O Lord, Thy word nitzav in heaven,” translated in the King James Version, “Forever, O Lord, Thy word is settled in heaven” [Psalm 119:89]. And that’s a good translation of nitzav: “Forever, O Lord, Thy Word is fixed in heaven; Thy word is established in heaven; Thy word is settled in heaven” [Psalm 119:89]. What the divine, inspired psalmist is saying, that before the word was delivered in earth, the word existed in heaven; and that this is but a copy of what God has written in heaven. The whole psalm is in that tenor. For example, in verse 152: “Concerning Thy testimonies, I have known of old that Thou hast founded them forever” [Psalm 119:152]. The one hundred sixtieth verse: “Thy word is true from the beginning: and every one of Thy righteous judgments endureth forever” [Psalm 119:160]. And then our text: “Forever, O Lord, Thy word is fixed, Thy word is settled, Thy word is founded and placed and kept in heaven” [Psalm 119:89]. This is but a copy of what God hath written and fixed forever in heaven. In Washington D.C. is located a bureau of weights and measures, and every weight and every measure that is used in the United States is a copy of the standard that is kept inviolate by the bureau in Washington. In that bureau there is a perfect inch, there is a perfect foot, there is a perfect yard, there is a perfect gallon, there is a perfect pint, there is a perfect millimeter, there is a perfect milligram; every weight and measure that we have finds its standard in that bureau in Washington. And all of our weights and measures are judged by that standard, and they are copies of that rule inviolate in Washington. In the naval observatory in Washington, at high noon, every day at twelve o’clock, there is a chronometer that is corrected by astronomical observations. And that time is kept correct by looking at those astronomical observations every day at high noon. And then that time is communicated to all of the clocks and all of the time pieces in the United States. What we have in the clocks all over America is but a repercussion, it is but a copy of the paragon of standard and excellence and perfection in that naval observatory in Washington D.C. So the psalmist says that this Word that we hold in our hands is but a copy of that perfect and fixed and unchanging Word of God in heaven [Psalm 119:89]. It was there in the beginning; it shall be there world without end, kept inviolate and inerrant by the sovereign God. Thousands of years ago there were thirty-nine books in the Old Testament; today there are thirty-nine books in the Old Testament. In the first Christian centuries, there were twenty-seven books in the New Testament; today there are twenty-seven books in the New Testament. And this Book is kept inviolate, inerrant by the word of God, by the power of the Lord, by the mandate of the Almighty [2 Timothy 3:16; 2 Peter 1:20-21]. Every jot and every tittle has been kept just as it has been through the thousands of years [Matthew 5:18]; they have never been changed. I hold in my hand my Hebrew Bible. Mr. Balka, who belongs to this church and is the finest Bible binder in all the world, he saw me use this at the 8:15 o’clock service, and he says, “Pastor, you mean to tell me that you use an old beat up Book like that?” He said, “Give it to me, and I’m going to bind it for you and make a beautiful volume out of it.” Well, I will be grateful for it. I’ve used that Hebrew Bible for years and years and years, over thirty years. Now I want you to look at it. You go along and read that Hebrew Bible, and there it is; except it starts at the back and goes to the front, and starts at this side and reads down the other side. When you go to those people and say, “What in the world are you doing reading all that backward?” They say, “Who’s doing it first?” Well, we start here, start over here, and it just goes along, just goes along, page after page, just goes along. Then all of a sudden for no reason at all, it’ll start saying the same thing in columns, started in columns, just like that, in columns, for no reason at all. There’s no reason to have those columns. It just reads right regular right across. But every Hebrew Bible in the whole wide world for thousands of years, ever since there has been a Hebrew Bible, is just like that: has those columns. Turn it again, there it is, one of these—by the way, you television camera, can you get that close up so the people looking on television can see it? Can you? Do you see my Hebrew Bible? Just goes along, just goes along; and then here, look at that, look at that. Yes, you have it, look at that. Every Hebrew Bible in the world is just like that; and for thousands of years it has been just like that. Just reading it right across, just right across, and yet one of those words stuck over there on that side. Nobody knows why, but from the beginning that we have known a Bible, every Bible has been just like that with every dot and every tittle in the same place. When I turn the Bible again, the Jews call this “brickwork upon brickwork.” Now look how that is written, just like a man would make a brick wall, brickwork upon brickwork. Every Hebrew Bible in the world is just exactly like that. And I can turn, oh, on and on and on. Every letter is counted, every jot and every tittle, and at the end of every book, all of those numbers were there so that the copyist in the thousands of years before there was such a thing as a printing press, so that every copyist would see that every jot and every tittle was written in God’s Word just as God had delivered it from heaven. The Bible that I hold in my hand, the Hebrew Bible, is the same Bible jot for jot, tittle for tittle, page by page, spot by spot that Jesus held in His hands [Matthew 5:18]. Some years ago, half a dozen years ago, there was discovered in a cave overlooking the Dead Sea, in a place called Qumran, Qumran, there were discovered, in an old jar, manuscripts. They were priceless manuscripts of Isaiah and of some other of the passages in the Bible. Those manuscripts antedated the present manuscripts that we have more than a thousand years. And yet, as we looked at those ancient manuscripts that are a thousand years older than any manuscripts that we have today, we found out that they were the same as the Masoretic text that is used in the publication of this Hebrew Bible here. God’s inerrant word, through the years the great paragon and the great master and the great final authority is what God has written in heaven; and the copy of that Holy Word is here in my hand. Down through the centuries human beings have tried to add to God’s Holy Word. The Council of Trent, the senate at Jerusalem, the bishops of Hippo said, and they voted, “We must include in God’s Book all of these books of the Apocrypha. They must be placed in the Bible.” But God said, “They shall not be placed in My Holy Word”; and they are not in the Bible. There is not a fair-minded Jew, and there is not a fair-minded Christian in the earth today who would include in God’s Holy Book the monstrous absurdities that you read in the Apocrypha. God said, “They are not My Word”; and they are not included. There were thirty-nine books in the Old Testament a thousand and a thousands years ago; there are thirty-nine today. And there were human men who said, “Now we must add to the twenty-seven books of this New Testament.” And so they wrote epistles, and they wrote gospels, and they wrote apocalypses, and tried to add them to the twenty-seven books of the New Testament. But God said, “They are apocryphal; and they rot away, just as if you tie fruit on a tree.” What did this psalmist say? “Forever, O Lord, Thy word nitzav, Thy word is fixed, Thy word is settled in heaven” [Psalm 119:89]. And what I hold in my hand is a copy of the original that God hath inspired [2 Timothy 3:16-17; 2 Peter 1:20-21], and does keep inviolate in glory. Now the second passage is a Greek verse, and a Greek word in the first chapter of  Peter, verse : “Being born again,” being saved, “not of corruptible seed, but of incorruptible, by the word of God, which liveth and abideth forever. All flesh is as grass, [and] the glory of man as the flower of the grass. The grass withereth, and the flower falleth away: But the word of the Lord endureth forever [1 Peter 1:23]. And this is the word which by the gospel is preached unto you” [1 Peter 1: 23-25]. 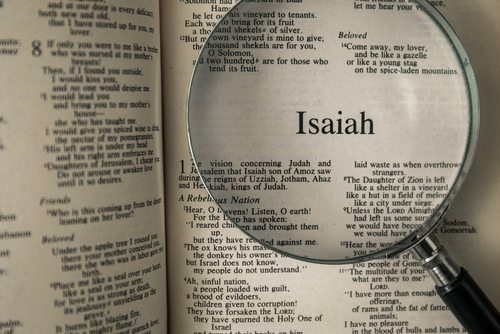 Now the apostle does an unusual thing there: he takes the verse out of the fortieth chapter of Isaiah and the eighth verse, “The grass withereth, the flower fadeth: but the word of God shall stand forever” [Isaiah 40:8]; then he adds to that a word, a Greek word. Look at it: “We are born again, not of phthartos, phthartos, corruptible, perishable seed, not of phthartos, but of aphthartos, of incorruptible, [by] the word of God, which liveth and abideth forever” [1 Peter 1:23]. So the apostle there was inspired to say the Word of God not only endures forever, stands forever, abides forever, but it abides aphthartos, it abides incorruptible, it abides inerrant, it abides without mistakes and without error [1 Peter 1:23]. And isn’t that a remarkable thing? Through all of the centuries, and through all of the millenniums, God’s sovereign grace cared for and protected that Holy Word so it would come down to us a copy of that original in heaven. The Lord God, the Holy Spirit of the Lord that watched over the incarnate Word in Bethlehem when Herod sought to destroy Jesus with the sword [Matthew 2:13-16], that same Lord God in heaven presides over the care of His Word [Psalm 138:2]. The same Lord God from heaven, the same Holy Spirit from above that kept from corruption the incarnate Word and raised Jesus from the dead [Matthew 28:2-6; Acts 2:27; Romans 1:4] is the same Holy Spirit of God, sovereign, almighty, that preserves from corruption this Word that I hold in my hand [1 Peter 1:23]. And the same Lord sovereign grace of God in His elective purpose that shall deliver us to heaven [John 14:3], that assures the salvation of His saints [Proverbs 2:8], is the same Lord God that keeps and preserves this Word [Matthew 5:18]. The Holy Spirit of God that inspired it [2 Timothy 3:16-17; 2 Peter 1:20-21], is the same Holy Spirit of God that keeps it, and no man, no council, no assembly, no convocation, no anybody or anything has ever been able to add to it or take away from it. “Born again of incorruptible seed, the word of God, which liveth and abideth for ever” [1 Peter 1:23]. Now, to me that is one of the most miraculous and wondrous things in all the earth. Remembering now it was not until about a thousand five hundred years after Jesus that printing was invented, and all of those millenniums, those thousands of years, those centuries and centuries, the Word of God had to be copied by hand, copied by hand, copied by hand. Well, how was it preserved inerrant? How was it kept just like that original up in heaven? It’s a very simple thing: God did it by the multiplicity of the manuscripts, so that if a scribe made an error in copying the Word of God, there would be a dozen, and a thousand, and a thousand other manuscripts to compare it with so that you could easily see where the scribe made an error in copying it. For God saw to it that there were thousands of manuscripts made of His infallible Word. And I say that that is a miracle. You look at this. One thousand five hundred years after…one thousand five hundred years after Herodotus had written his history, there was only one copy of it in the whole world, only one manuscript in the whole world. One thousand two hundred years after Plato had written his glorious classics there was only one manuscript of it, one copy of it in the whole world. Did you know to this present day there is only one manuscript of the Annals of Tacitus? To this present day there’s only one manuscript of the Greek Anthology. To this present day there are just a few, a very few manuscripts, of Sophocles, of Euripides, of Thucydides, of Virgil, or of Cicero. But, there are thousands and thousands of copies of the Word of God, by which you can compare to see that they are inerrant and kept just like that original in glory. One of our Greek scholars has estimated that there are more than four thousand one hundred five Greek, ancient Greek manuscripts of the New Testament. Another one said there are at least between fifteen thousand and thirty thousand ancient Latin versions of the Holy Scriptures. Another said there are more than one thousand ancient versions of other languages, beside the papyri that they are daily discovering in these archaeological digs, and beside the quotations you find in the church fathers. By comparing these thousands of manuscripts, it is easy to see the original that God hath inspired in heaven. If one copyist made an error, God saw to it that other copyists did not make that error; just like if one preacher departs from the faith, God sees to it that there’s another preacher raised up true to the message. If one church departs from the faith, God sees to it that another church stays true to the gospel. If a whole denomination departs from the faith, God sees to it that there’s another denomination raised up that preaches the gospel of the grace of the Son of God in all of its glory and in all of its fullness. “We are born again, we are saved, by incorruptible seed, aphthartos, incorruptible, even the word of God, which liveth and abideth forever” [1 Peter 1:23]; kept inerrant by the sovereign grace of God [Psalm 138:2]. The grass withereth, the flower fadeth: because the breath of the Lord bloweth upon it: surely the people is grass. but the word of our God yaqum forever. What does yaqum mean? “But the word of our God yaqum,” it is translated here “shall stand forever” [Isaiah 40:8]. Yaqum means “to rise.” Here is something prostrate, here is something crushed, here is something ground under the heel: yaqum means “to stand up”; yaqum means “to rise.” And to me, one of the ideas of the prophet in writing that verse, “The grass withereth, dead, the flower fadeth, perishing, but the word of God, though crushed, though persecuted, though despised, though destroyed, the word of God shall rise, shall stand, shall abide forever” [Isaiah 40:8; 1 Peter 1:23-25]. Against that Holy Bible some of the most cruel and merciless of all of the persecuting powers and strength of men have been dedicated. I’m going to speak of three of them in the little time that is allotted us remaining this morning. First, pagan persecution: and out of the story of pagan persecution against those who held this Bible, and the attempt to exterminate and destroy and to extinguish this Book, I choose one, Diocletian; because Diocletian instituted the most violent and merciless persecution against the Bible and the people of the Bible that the world had ever known. In 303 AD, in 303 AD, Diocletian, who was the emperor of the Roman Empire, decreed that every Bible in the world should be destroyed, and the people who possessed them should be slain, martyred. In 303—now get that date in your mind, because we’re going to speak of it again in a moment—in 303, in 303 AD, Diocletian decreed that every Bible should be destroyed, and everyone who possessed it was to be martyred, to be slain. And so effective was that horrible and cruel and merciless onslaught, that in about a year or two, they supposed that they had eradicated and exterminated the Bible from the face of the earth, and myriads and myriads of Christians laid down their lives, discovered loving the Word of God. So triumphant was Diocletian in his onslaught against the Bible; they told him, his wise men told him, “They are a people of the Book, and if you destroy that Book, you’ll destroy the people.” So they sought to destroy the Book. And so triumphant was Diocletian in that onslaught, that over a burned and extinguished Bible, he built a column and on it wrote these words in triumphant Latin: “Extincto nomine Christianorum. The name of the Christians is extinguished”; drowned in blood, and in fire, and in tears, and in martyrdom, and in death. Now I told you to remember that date, 303. Can you tell me when it was that Constantine, the emperor Constantine, who was the successor of Diocletian, the emperor Constantine declared himself a Christian, when he was the Caesar of the Roman Empire; and he took off the heathen, pagan symbols on the standards of his Roman army and off of the shields of his soldiers, and he placed thereon the cross of the Lord Jesus Christ? Is there a schoolboy here who could tell me when that happened? That happened in 312 AD. How many years after Diocletian erected his column over a burned and destroyed Bible, saying that the very name of the Christians was extinguished? Within six, seven, eight, or nine years. “The flower fadeth, the grass withereth: but the Word of our God yaqum, stands up, abides forever” [Isaiah 40:8]. Now I speak of a second persecution, an ecclesiastical persecution. Isn’t it a strange thing? Isn’t it an almost inexplicable thing that the bitterest enemy of the Word of God should be the ecclesiastic, churchmen? Isn’t that an amazing thing, to destroy the Bible, to burn up the Bible? Martin Luther was a churchman all his life. Martin Luther was a grown man when he said, “I have never seen a Bible.” And when John Wycliffe sought to take this Holy Book and place it in the vernacular, in the language of the people, the terrible Inquisition could not reach him before he had died; but they dug up his body, and they burned it, and they strewed the ashes on the bosom of the River Swift. And when anyone was found with a copy of the Scriptures translated by John Wycliffe into our English language, if anyone was found with a copy of the Bible, it was tied around their necks, and they were openly burned at the stake. But when the ashes of John Wycliffe, because he had translated the Bible and gave it to the people, when the ashes of John Wycliffe were strewn over the River Swift, the River Swift runs into the Avon, and the Avon runs into the Severn, and the Severn runs into the sea, and the sea bathes the shores of the seven continents of the world. And wherever the waters of the sea carried the ashes of John Wycliffe, there also was borne the Word of God. “The flower fadeth, the grass withereth: but the Word of God yaqum, shall stand up, shall rise, shall endure forever” [Isaiah 40:8]. But did you know, one hundred years from the time that Voltaire made that prophecy that there wouldn’t be a Bible in the earth except one looked upon as an antiquarian curiosity, did you know exactly one hundred years from that day when Voltaire made that prophecy, did you know, on that day a first edition of Voltaire sold in the markets in Paris for ten cents? And on that same and identical day, the British government paid to the czar of Russia five hundred thousand dollars for Codex Sinaiticus, a copy of the Word of God discovered by Tischendorf in the monastery of Mt. Sinai. And did you know, when Hume looked and said, “I think I see the twilight of Christianity,” Hume got mixed up: he couldn’t tell sunrise from sunset. Old hammers worn out with beating years of time. You kids around here, tell me, how many of us read books that are a thousand years old? Well, some of you read Virgil, and some of you read Cicero, and some of you read Caesar; but you’re doing it because it’s jammed down your neck in the school that you attend. Who reads a book a thousand years old? Who does? Who reads a book of religion? Did you ever see anybody sitting down reading the Avesta of the Parsee, reading the Tripitaka, The Three Baskets, of the Buddhists, reading the Vedic hymns of the Hindus? Ever see anybody sitting down reading the six classics of Confucius? Who reads a book of religion? Who does? Go further, who reads a book translated out of another language? It is a rule of thumb that no book written in a language and translated in another has any opportunity at all of being circulated. By that I mean this: there’s no book written by a Spaniard that has any opportunity for wide circulation among English or German. For example, who are the great authors today in Turkey, or yesterday? Who are the authors in Brazil? Who are the authors in Afghanistan or China? We don’t know whether they have any authors or not. Any books written in another language have no opportunity of circulation in still another one. What language was this written in? Hebrew. What language was this written in? Greek. Those Greek languages in which that has been written, those, that Hebrew language in which that has been written, have been dead languages, they call them “dead languages,” for thousands of years. And yet that Book, going into the house and family and nation and civilization, increasingly so, all over this earth. Diocletian broke not one of the strings of the glorious harp. The rationalists have not drowned in infidel ink one word from its immutable revelation. And Bolingbroke, and Hume, and Paine, and Voltaire have not shortened its life by one hour. God’s Word shall live forever. “The grass withereth, the flower fadeth: but the word of our God yaqum, shall rise, shall stand, shall endure for ever” [Isaiah 40:8]. Isn’t that a marvelous thing? Build your faith, build your life, build your soul, build your hope, build your destiny on the immutable and unchanging and inerrant Word of God. Ah, to receive God’s testimony is to receive God Himself. To love God’s Book is to love God Himself. To receive the Holy Word is to receive the Lord Himself; for God’s Word is like God Himself, the same yesterday, and today, and forever [Hebrews 13:8]. Now while we sing our invitation hymn, somebody you, give himself to Jesus, come and stand by me. A family you, coming into the fellowship of the church, come and stand by me. In this balcony round, there’s time and to spare; there’s a stairway on either side at the front and the back, come. And into these aisles and down here to the front, come, “Pastor, I give you my hand; I give my heart to God. Here I come, here I stand, taking Jesus as my Savior,” or, “Putting my life in the fellowship of this dear church,” make it this morning. Make it now, while we stand and while we sing.